A while ago the company I work for started migrating some of their client websites, to a new (more robust) server. What we needed (to save time etc.) was the ability to retrieve/perform certain IIS actions programmatically using C#. Now there is numerous ways to achieve this, one method we're going to look at involves ADSI (Active Directory Service Interfaces) - you will find a few seriously handy classes under the System.DirectoryServices namespace. These classes provide us with a simple way to access Active Directory service providers e.g. LDAP, NDS, WinNT and IIS. In this post (as the title suggests) the aim is to retrieve a list of websites on an IIS server, along with their physical paths and site status etc. We're going to create an enum that lists possible states the websites can/might be in. Next we need to connect to the IIS WWW publishing service (W3SVC) using the DirectoryEntry class. Chances are (especially if you're using IIS 7) that you got an exception along the lines of "Unhandled Exception: System.Runtime.InteropServices.COMException (0x80005000): Unknown error (0x80005000)". Which means its likely that you don't have the IIS 6 Management Compatibility installed (programs and features). 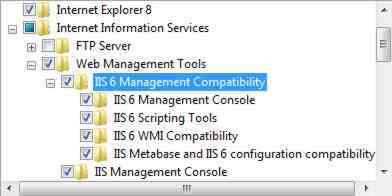 But surely there must be an IIS 7 alternative - why would we need to install compatibility tools etc for IIS 6 in order to manage IIS 7? Microsoft did indeed provide an IIS 7 alternative, you'll need to include a reference to the Microsoft.Web.Administration assembly which is located within your inetsrv folder under system32. Using the following snippet we're able to retrieve the websites via the ServerManager class. And that's it, this should give you a basic starting point, if you're looking at other alternatives WMI seems to be another option worth looking into - which also seems to be an IIS 6.0 based solution. @sheoh, can you please elaborate? Hi Hernaldo The user/account accessing iis needs to have rights in order to manage websites. if i use a remote access: System.DirectoryServices.DirectoryEntry iisServer; iisServer = new System.DirectoryServices.DirectoryEntry("IIS://remote-server/W3SVC/1"); System.DirectoryServices.DirectoryEntry rootFolder = iisServer.Children.Find("Root", "IIsWebVirtualDir"); //exception here its give error: An unhandled exception of type 'System.Runtime.InteropServices.COMException' occurred in System.DirectoryServices.dll Additional information: Access is denied. Nice! and thanks for sharing..